So when I arrived at a wedding a few weeks ago to an entire table of beautiful mini cakes – I knew the night was off to a good start. Vanilla, chocolate, mocha…. I think Jay opted for vanilla (someone’s adventurous…) And despite the selection of delicious options – it was the lime cupcake that caught my eye. Maybe it was love in the air, the glass of wine I downed earlier or the fact I was wearing a dress for the first time in a good 8 months – but for whatever reason I jumped out of my comfort zone and didn’t reach for chocolate. And that lime cupcake was just plain fabulous. Obviously – I had to recreate & revamp these delicious morsels for my own kitchen adventuring. Enter Lemon Lime Cupcakes. Fluffy, ridiculously moist vanilla cupcakes with a hint of lemon lime and piled with ridiculously smooth lime buttercream. Never tart and not too sour – just perfect citrus flavor with pretty summertime colors. Think fresh, summertime fun in cupcake form. Think your favorite vanilla cupcake put on its party dress and is here to celebrate warm weather, beach parties and patios. 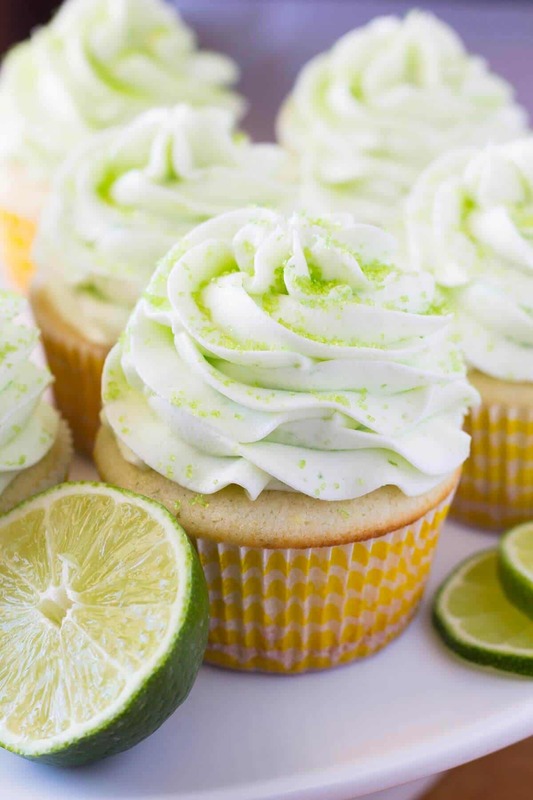 Yes – these Lemon Lime Cupcakes are my new staple for summer. And after one bite – you’ll understand why. They have a fine, super soft cupcake crumb and are perfectly moist without being the slightest bit greasy. We’re using cake flour for the delicate texture, and eggs whites to keep them perfectly fluffy. You’ll want all your ingredients at room temperature before getting started to help get that perfect cupcake texture. Then the lemon lime flavor in the cupcake batter comes from fresh lemon zest, lemon juice and lime zest. 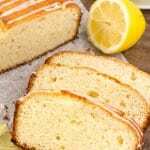 It’s absolutely pertinent that you don’t use lemon juice from a bottle – it’s too tart and will leave your cupcakes with a less than pleasant taste. Then the frosting is a lime buttercream that gets its flavor from lime zest and fresh lime juice. I added a few drops of green food coloring to my frosting for more color, but this is totally optional. The lemon lime isn’t too strong, so they don’t taste sour. Instead the buttery taste of classic white cupcakes and the richness of the buttercream pair perfectly with the bright citrus hues. They’re seriously the best cupcake for summer, and if you’re looking for a slight twist on vanilla or white cupcakes – you’re going to want to add these to your baking list. These Lemon Lime Cupcakes are perfect for summer. Fresh citrus taste, ridiculously soft cupcake crumb & topped with perfectly smooth lime buttercream! Line a muffin pan with muffin papers. You'll end up with about 12-14 cupcakes. In a medium sized bowl whisk together the flour, baking powder and salt. Set aside. In a separate large bowl using an electric mixer, beat together the butter, sugar, lemon zest & lime zest until the mixture is light and fluffy. Add in the vanilla, egg whites and lemon juice and beat until well combined. Turn the mixer down to low and carefully beat in about 1/2 of the flour mixture, followed by 1/2 of the milk. 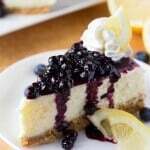 Turn off the mixer and scrape down the sides of the bowl using a large wooden spoon or rubber spatula. Turn the mixer back on to medium-low speed and add in the second half of the flour, followed by the second half of the milk until the batter is smooth. Carefully spoon the batter into the prepared muffin tin, filling each paper to about 2/3 full. Be careful not to over fill your muffin tray. Bake in the preheated oven for 16-18 minutes, or until an inserted toothpick comes out clean. To make the frosting, beat the butter on medium-high speed until fluffy and the color lightens. Turn the mixture to low speed and beat in 3 cups of powdered sugar. Once the mixture gets thick, add in the salt, lime zest and lime juice. Beat in the rest of the powdered sugar and whipping cream 1 tablespoon at a time until the desired consistency and sweetness level is reached. Beat in the food coloring (if using). Frost cupcakes by using a piping bag, or by spreading with a flat-edge knife. Shower with sprinkles & devour. These had the best citrus flavor! I made them for a baby shower and decorated with lime slices and they were the first thing gone! Can I freeze these without the frosting?